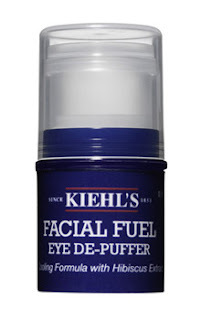 Obsession of the Day: Kiehl's Facial Fuel Eye De-Puffer | Fashion. Style. Beauty. | Life is short. Live well. Ok, you know that if it’s worth knowing about, I’m going to tell you. I put this product through the ultimate test, New York Fashion Week and after reviewing photographs and my own reflection, this is a product EVERYONE needs to have in your medicine cabinet. Actually, let me take that back: you need this in your car, diaper bag, handbag, pocket, rucksack, workstation and nightstand. People, this product does exactly what it says it does. After weeks of trying everything to get rid of the baggage under my eyes – which would no longer fit in an overhead compartment, much less on my face – I received this little bundle of joy in a gift bag prior to Fashion Week. I used it twice a day for the whole week and yep, it works. The bags went down and heralded the return of my sunny disposition. This is a must-have for people who have crying babies, long work hours or just a generally stressful existence (raise your hand if this ISN’T you because I have some things I need you to take care of for me.) It’s compact, it’s cheap and the stuff works. Run, do not walk, to get some of this magical goodness right this minute.